Add CIO’s Tom Kaneshige to the list of technology writers hoping to ride the Apple fail wave all the way to Bad Analysis Beach. Apple in 2012: 5 Reasons It Will Be a Tough Year (tip o’ the antlers to Shawn King writing at The Four Misanthropes of the Apocalypse). So, to what do we owe the pleasure of having to watch you lay this particular oeuvre, Tom? That’s right. As hard as it is to believe, as flabbergastingly tone deaf as one would have to be to commit such an atrocity on logic and common decency, Kaneshige uses our old pal Rob as the primary source for “analysis” in this piece. Which is, of course, spread over three pages, because you know how hard it is to put that much text on one webpage. Why, the very idea of so much text on one page is simply inconceivable to anyone who knows anything about HTML and its well-known limit of 500 words per page. Look, the Macalope’s not going to bother deconstructing Enderle’s comments. King already did a yeoman’s job of that and really, what’s the point? Apple “analysis” comes flying from Rob’s mouth like angry, stupid bees from a hive that produces wrongness instead of honey. Instead, the horny one is going to focus on the ridiculous impropriety of anyone quoting Enderle in a piece about Apple. We’ve been through this, people. If you’re not going to do the required reading, why are you still pretending to be in the class? It’s hardly worth chastising Enderle anymore. He’s just making a living at the oldest profession. What is not understandable, however, is why anyone would prop Enderle up as some unbiased source. 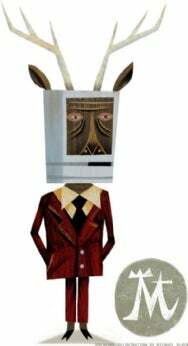 Unlike some other people in the Apple community, the Macalope does not believe Rob is dumb. Indeed, we have some empirical evidence that he actually gives his clients good advice, whether they listen to him or not. But it should be patently obvious to anyone that pays any attention to his rantings about Apple over the years that what he says is, conveniently, precisely what Apple’s competitors (i.e. his clients) want to hear. “Apple’s in trouble! The iPhone is going to kill your children! Windows 7 will destroy Apple!” And so many, many more. Does anyone think Enderle—Rob Enderle of the Enderle Group and the Moustache Club for Men, whose client list reads HP, Dell, Microsoft, and on down to Joe's PC Shack in Sarasota, Florida—has contacts inside Apple, or the Apple community, or even anywhere within the court-mandated 300-yard berth that he has to give every Apple Store, that actually give him information? Let’s just say this again, since some people have apparently not gotten it. When Rob Enderle speaks about Apple, he is doing it solely at the behest of his paid masters and not in the interests of any higher value such as truth, accuracy, or intelligent discourse. That clear enough for everyone?